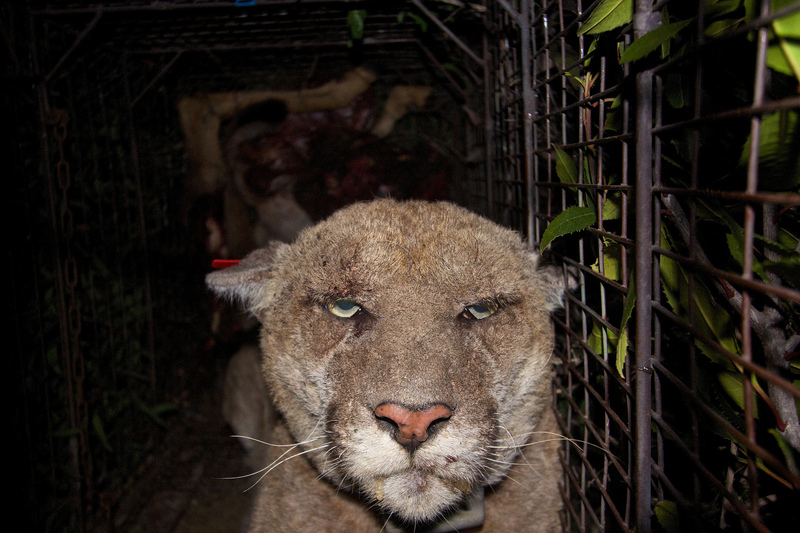 In March 2014, celebrity mountain lion P22 tested positive for anticoagulant rodenticides. Here is a photo of him suffering from mange. P22 Mange by the National Park Service. Public Domain. On December 1, 2016 I attended a talk hosted by tracker and Humboldt State University student Phil Johnston. In it, he spoke of a grave threat to Northern California’s mountain lions (Puma concolor): trespass marijuana grows. This is a serious problem that needs attention, and I recently sat down with Phil to learn more about it. What follows is a shortened version of our conversation. 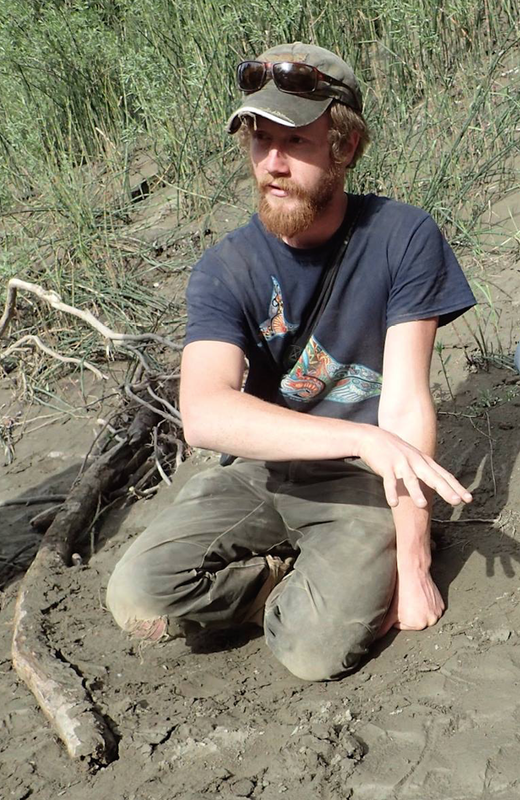 Humboldt State University student and tracker Phil Johnston. Talking about Rabbit Tracks. Image © Kim Cabrera. You said in your talk that you work in the Hoopa Valley. How long have you been working there, and what do you do? I’ve worked in Hoopa for two years. I work for the tribe, and run the tracking portion of their fisher (Martes pennanti) conservation program. I’m also a crew leader for their mountain lion program. What are trespass marijuana grows? Trespass grows are very different from legal ones (known locally as 215 grows). These operations take place without the permission of landowners, occur on both public and private lands, are not regulated, and are sometimes run by multi-million dollar drug cartels. These growers have no incentive to take care of the land, and are incredibly messy and environmentally destructive. At your talk you mentioned that one harmful aspect of trespass grows are the large amounts of rodenticides (rat poisons) they use. What are these rodenticides, and how do they affect wildlife? Trespass growers are deploying vast amounts of rodenticides; so much so that it’s contaminating the water and showing up in plants. Many of them are commonly available anticoagulants, such as Tomcat. These toxins cause internal hemorrhaging and eventually death: animals bleed out internally. I believe you said in your talk that these anticoagulants actually dissolve animals’ internal organs. Is that correct? Yes, that’s true. In addition, it takes 3-4 days for animals to die. This means they continue to eat the poison, and can contain up to 20 lethal doses when they pass. Rodents weakened by these toxins make attractive prey for predators, such as fishers. Mountain lions then eat the fishers, becoming poisoned themselves. 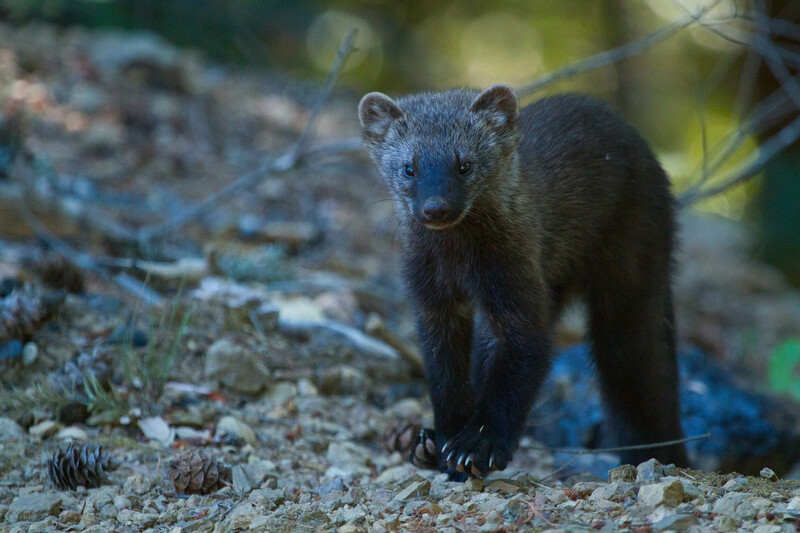 Poisoned rodents make easy prey for fishers, such as the one featured here. They thus accumulate high amounts of anticoagulants, and are often eaten by mountain lions – sending the toxins up the food chain. Curious Fisher Head-On. Image © Phil Johnston. What sorts of impacts are trespass grows having on mountain lions? I’m beginning a study right now to find out. However, preliminary evidence suggests this could be a major problem. Every mountain lion that’s been tested in California has contained at least trace amounts of these rodenticides, and the cats’ population in Hoopa seems to be crashing. Six mountain lions disappeared eight months ago, and their territories have yet to be filled. This is extremely unusual: especially since none of the individuals who vanished were at dispersal age. I also know of a family of three mountain lions who ate a poisoned fisher. All of them died, and we found two of the carcasses. Both tested positive for rodenticides. One of the reasons trespass grows could be so problematic for mountain lions is the cats’ ranging behavior. They have huge territories, which means they’re guaranteed to encounter unethical grows. 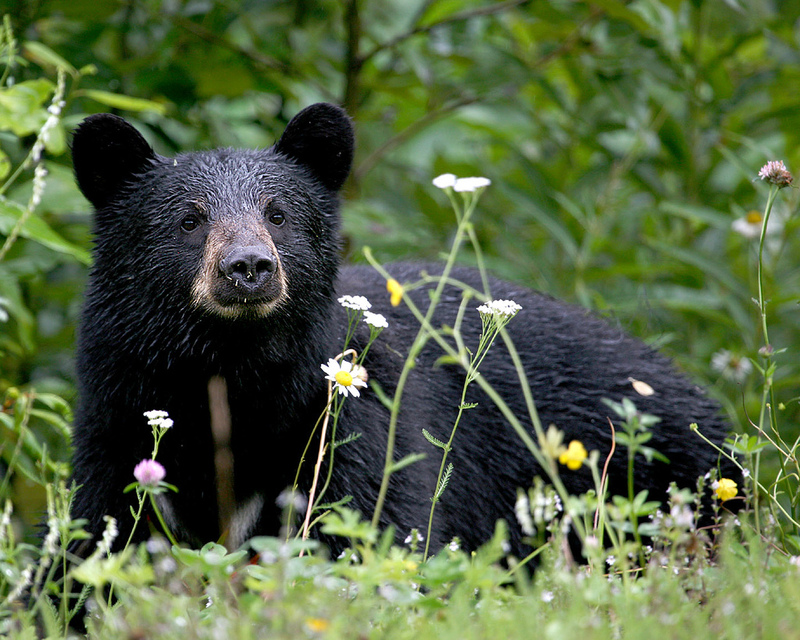 Furthermore, the Hoopa Valley contains the highest density of black bears (Ursus americanus) in the world. The bears often chase mountain lions off their kills, forcing them to hunt more often. This might also cause mountain lions to hunt smaller prey, like fishers. This may be increasing the amounts of toxins they are consuming. What can the average person do about this problem? The most important thing they can do is to know where their weed comes from. When you buy from bad grows, you’re financing the destruction of our wildlife. Two more crucial activities are to spread the word and be politically active. Talk about this issue amongst your friends. Also, call your state representatives and let them know you’re concerned about this. Lastly, read ballot measures and vote for ones that will generate funding for combatting trespass grows. We’re up against wealthy crime syndicates, so we need more resources. But let me be clear, this is not a war against marijuana: it is a war against illegal agriculture. There are lots of ecologically responsible growers in Humboldt County who are an important part of our community. We want to help them by reducing competition from the trespass growers who are poisoning our woods. I would like to thank Phil for agreeing to this interview, and for advocating for Humboldt County’s wildlife. Please, help spread the word about this problem. People need to know about it! Wow, I had no idea about this. Interesting piece. Weed laced with rat pesticides are worst than Monsanto, smh. Wow! This would make for an interesting documentary. Yea man, it’s really bad in some areas up here. And I left out a lot of information in order to keep the post short. More people need to know about this. That’s crazy. Really interesting information. Keep this up Josh, and I will see you on Netflix soon. Hahaha! We’ll see about the Netflix thing. Thanks for the support, Eddie. Oh no, that’s too bad. Thanks for the informative post! Great to bring out awareness. Thanks Rose! It’s definitely important to tell more people about this problem. Wow! Very interesting. I will forward your post. Thank you! We need to spread the word. I thought the information in this post worth passing on. I’m absolutely on the side of marijuana. It’s kept my husband alive since his cancer treatments. But I’m totally against these irresponsible, destructive, jerks who don’t care about anything but profit! Thanks Elizabeth! Marijuana is an important part of the culture up here, and there are many responsible growers who are crucial members of our community. But the way these trespass grows are being conducted are harmful for the environment, and an insult to the landowners. It’s the actions of these specific growers that I dislike: not marijuana itself. I got that impression (not anti-pot) from your post. Medical marijuana is, thank goodness, legal in Michigan where I live. My husband’s oncologist suggested it as soon as Mr. C’s feeding tube came out! Legalize organic weed and forbid chemicals. It is because the growers try to make as much $$ as possible from a set amount that they use every chemical possible. Same thing happened with tobacco, farmers were given a limited number of acres, then used carcinogenic chemicals. Organic tobacco has probably NEVER BEEN TESTED. Weed is legal here in California, and the culture up here in Humboldt County is very accepting of marijuana and growers. I had to leave out a lot of information to keep this post short, but the problem up here in Humboldt County is a bit more complex. The growers who are putting out all of these rodenticides are what’s known as ‘trespass growers:’ which means they’re growing on land which they have no right to be on: in this case the territory of the Hoopa Tribe. Oftentimes they’re run by international drug cartels, and not community members. Also, the main reason they put out so much poison is to kill bears. They’re terrified of bears (many of these growers are from outside the US and aren’t used to them), and their camps are extremely messy. Obviously this attracts bears. So in this case, forbidding chemicals wouldn’t do much good. These trespass growers are operating outside of the law, and do not abide by any regulations. The best thing to do is to shut them down, while also supporting growers who are environmentally conscious. You’re right that we need to make it so that these bad grows are less profitable. That’s why it’s so important that people know where their weed comes from; so that they can make sure they’re buying from ethical growers. But it’s much easier to ask those questions if weed is legal, so you have a point. P.S. I thought I was on Jolliesattic’s comments! Pleased to meet you- she is a much fun writer, no? Haha, pleased to meet you too, and she certainly is! It is quite unique, and very alarming. More people need to know about it. I don’t live in a state where marijuana is legal, but I feel as though the overuse of pesticides, rodenticides and biocides are a universal problem that will eventually lead to our own destruction. We (the collective we which includes the entire planet) simply can’t be ingesting this stuff and not have it cause a complete imbalance in the ecosystem. Unfortunately, despite the increase in cancers, etc., we’ve made the decision in favor of agribusiness and against the individual. Sad for those of us who don’t want to live that way. That could well be true, especially for the underpaid farm workers who have to be around those chemicals constantly. But the volumes of rodenticides being used on trespass marijuana grows are exceptionally high, and consequently are exceptionally damaging. This needs to stop. This is such a bizarre situation – as a native Californian who’s encountered a substantial amount of mountain lions while hiking (and boy, did we ever find so many trespass growing operations in puma territory central CA), it’s really saddening to see illegal growing have such a profound impact on our endemic wildlife. This should serve as another example why further legalization of marijuana is not just a health benefit, but an environmental one as well. We desperately need to transfer the focus on local community organic growers. Anything that takes profits away from unethical, destructive, and greed-crazed grow operations is good in my books. We need to get marijuana cultivation out of the back woods and into more established agricultural areas, and that won’t happen without legalization.